I sell both green and dried peanuts boiled. I prefer green boiled peanuts, but we get dried year around at Columbia's farmers market. 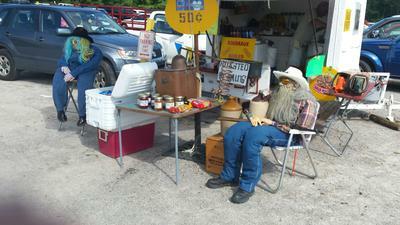 We have Cajun and regular flavored boiled peanuts and sell plenty every week at US1 flea market here in Columbia. I have a lot of repeat customers. They say my boiled peanuts are the best! We also have moonshine jelly and mixins.